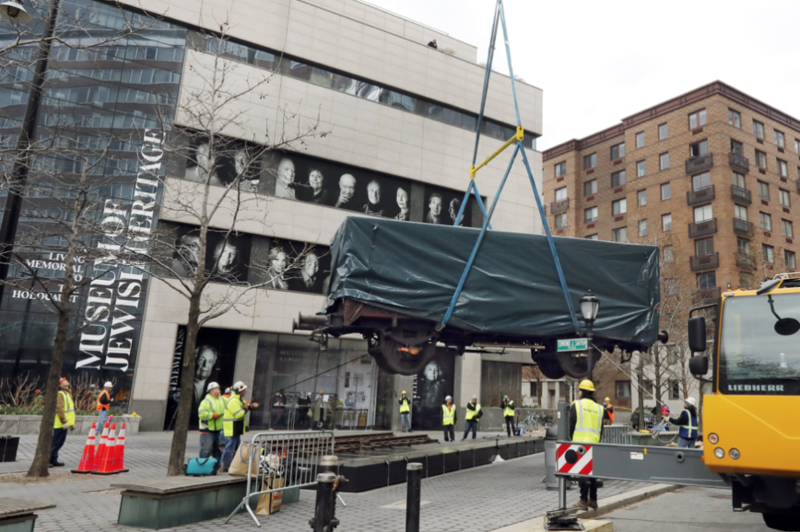 New York, NY – A German-made Model 2 freight car was delivered and installed today outside the Museum of Jewish Heritage – A Living Memorial to the Holocaust as part of the travelling exhibition Auschwitz. Not long ago. Not far away., that will open in Manhattan, New York City, on May 8, 2019 and run through January 3, 2020. Featuring this freight car and more than 700 original objects from Auschwitz, this groundbreaking exhibition, produced by the international exhibition firm Musealia and the Auschwitz-Birkenau State Museum in Poland, will display the biggest and more comprehensive collection of artifacts never before exhibited in North America. This freight car is one of 120,000 built between 1910 and 1927, used by the Deutsche Reichsbahn (German National Railway) to transport foodstuffs, goods, and livestock. During World War II such trains cars were also used to transport soldiers and prisoners of war, and to deport Jews, Roma and others to ghettos, killing centers and the German Nazi concentration camps across occupied Europe, explained today Bruce C. Ratner, Chairman of the Museum’s Board of Trustees. “The freight car is symbolic of the murder of millions people. Auschwitz is not ancient history but living memory, warning us to be vigilant, haunting us with the admonition ‘Never Again.’ It compels us to look around the world and mark the ongoing atrocities against vulnerable people, and to take a firm stand against hate, bigotry, ethnic violence, religious intolerance, and nationalist brutality of all kinds,” said Bruce C. Ratner. Between June 1940 and January 1945, at least 1.3 million people were deported to Auschwitz, of whom 1.1 million were murdered there, including ca. 1 million Jews. Most were transported to the most lethal and biggest German Nazi Camp in train cars such as the one being placed on display. Approximately 80 people and their belongings were crammed into each train car with a single barrel for sanitation and a can of drinking water, on a trip from which most never returned. The train cars brought people to extermination centers on a journey that could last many days, and returned filled with their looted possessions. 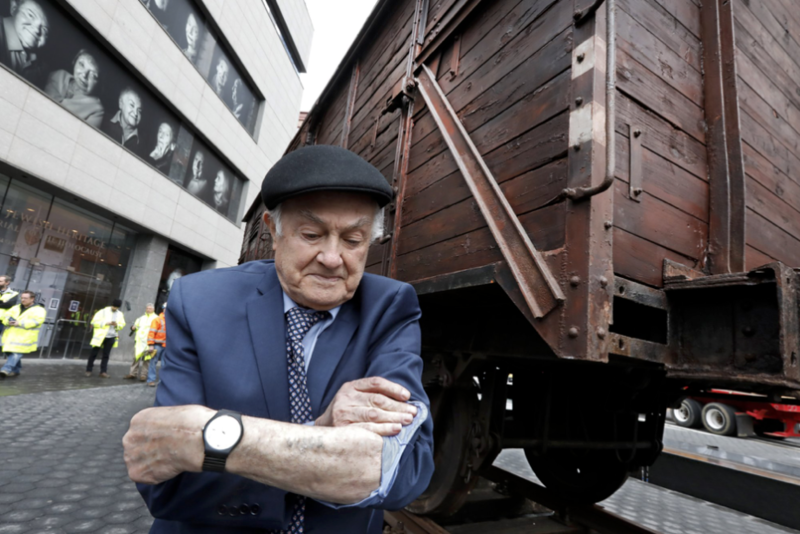 In this sense, Ray Karner, a survivor of Auschwitz who was present when the freight car was installed, remembered that “There were 80 people squeezed into one wooden car, with no facilities, just a pail to urinate”. “You couldn’t lie down, so you had to sleep sitting, and it smelled.”, said this 92-year-old woman who still works as a Manhattan dental office manager. The freight car, which was covered, was delivered on a flatbed truck. 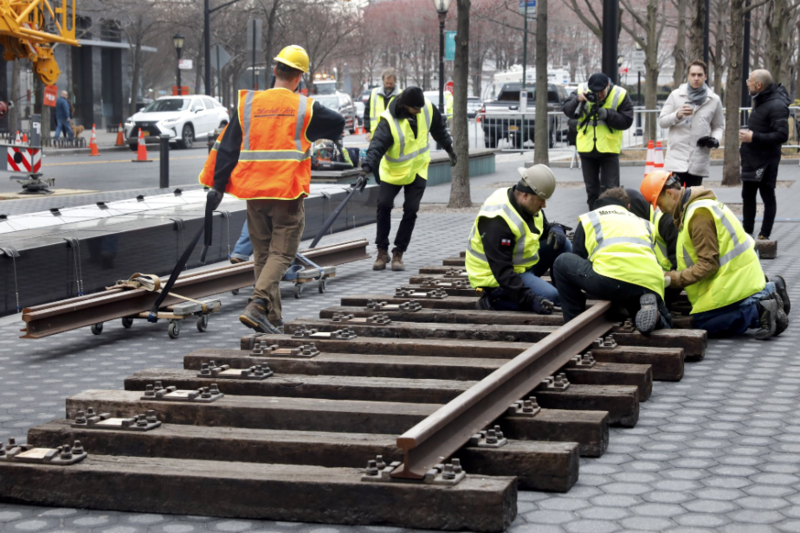 Rails were laid on the plaza in front of the Museum. A crane lifted the box car, 11.5 ft. wide x 31.5 ft. long and approximately 215 square feet of space, into place. Auschwitz. Not long ago. Not far away. arrives in New York City after the exhibition completed a successful run at Madrid’s Arte Canal Exhibition Centre, where it was extended two times, drew more than 600,000 visitors, and was one of the most visited exhibitions in Europe last year. It has been conceived of by Musealia and the Auschwitz-Birkenau State Museum and curated by an international panel of experts, including world-renowned scholars Dr. Robert Jan van Pelt, Dr. Michael Berenbaum, and Paul Salmons, in an unprecedented collaboration with historians and curators at the Research Center at the Auschwitz-Birkenau State Museum, led by Dr. Piotr Setkiewicz. “The historical train car is one of the most important symbols of the horrifying systematic plan of mass extermination of Jews as well as terror and hatred unleashed within German-occupied Europe against many other groups. 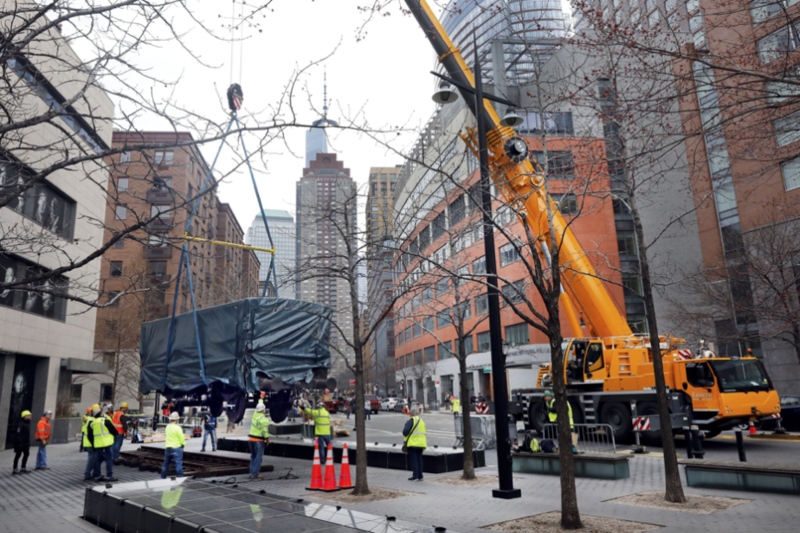 It is now placed less than two miles from the Statue of Liberty – a symbol of freedom, a welcoming sight to all immigrants who search for hope and their new better future in the United States. This shows us why we need to remember about the tragic past. Freedom, democracy, human rights and justice are not given once and for all. We remember to strengthen our responsibility for protecting those values”, mentioned Auschwitz Birkenau State Museum’s Director, Piotr Cywinski. The exhibition explores the dual identity of the camp as a physical location—the largest documented mass murder site in human history—and as a symbol of the borderless manifestation of hatred and human barbarity. Featuring more than 700 original objects and 400 photographs, the New York presentation of the exhibition will allow visitors to experience artifacts mainly from the Auschwitz-Birkenau State Museum, and other 20 worldwide institutions and private collections on view for the first time in North America, including hundreds of personal items—such as suitcases, eyeglasses, and shoes—that belonged to survivors and victims of Auschwitz and, also, other artifacts that depict the world of the perpetrators—SS men who created and operated the largest of the German Nazi concentration and extermination camps. Other artifacts include concrete posts that were part of the fence of the Auschwitz camp; fragments of an original barrack for prisoners from the Auschwitz III-Monowitz camp; a desk and other possessions of the first and the longest-serving Auschwitz commandant Rudolf Höss; a gas mask used by the SS; and Picasso’s Lithograph of Prisoner. “Each object in the exhibition is a fragment of history that has its own voice, its own historical echo. They establish a very personal conversation with each visitor. 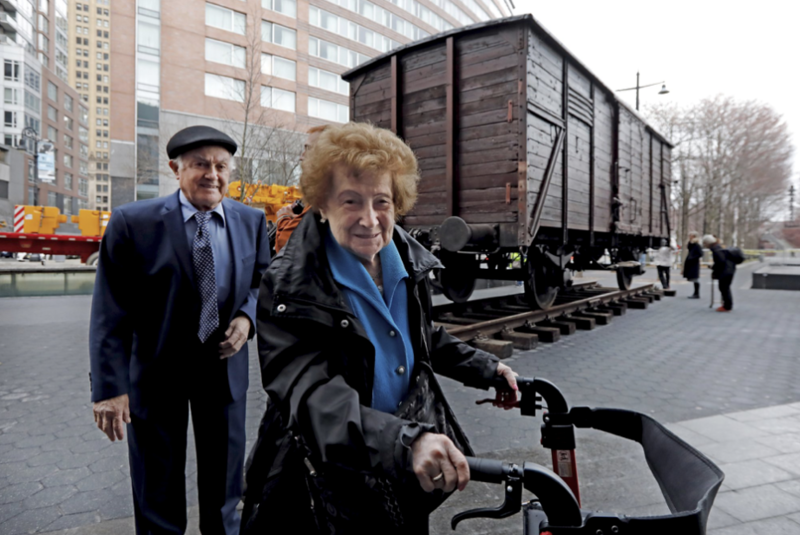 In this case, an original wagon will allow all passersby to reflect on how the memory of Auschwitz is part of our modern world. Understanding how that place came to be, and what this means for our view of ourselves, is one of the core purposes of this project”, explained Musealia’s and the exhibition’s director, Luis Ferreiro. In addition to the Auschwitz-Birkenau State Museum and the Museum of Jewish Heritage – A Living Memorial to the Holocaust, participating institutions include Yad Vashem in Jerusalem, Anne Frank House in Amsterdam, United States Holocaust Memorial Museum in Washington, Auschwitz Jewish Center in Oświęcim, the Memorial and Museum Sachsenhausen in Oranienburg, and the Wiener Library for the Study of the Holocaust and Genocide in London.